The loon mini is quilted in-the-ditch. 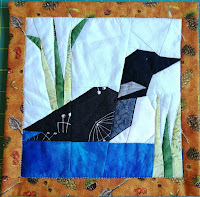 I found some fabulous foundation paper pieced patterns for making woodland animals blocks. Here's how it started. My October DrEAMi! (something that catches your fancy and you just have to Drop Everything And Make It!) was a foundation paper pieced block that I gave my brother for his birthday instead of a card. Since he loves the outdoors, I made him a loon. This is the first of several minis that I'll be making using Made by Marney's patterns. 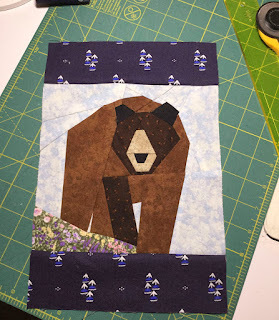 The finishing of the loon mini and the making of the bear mini are my November DrEAMi! My next mini was a bear - well actually two bears because I'm making a second one for my husband. 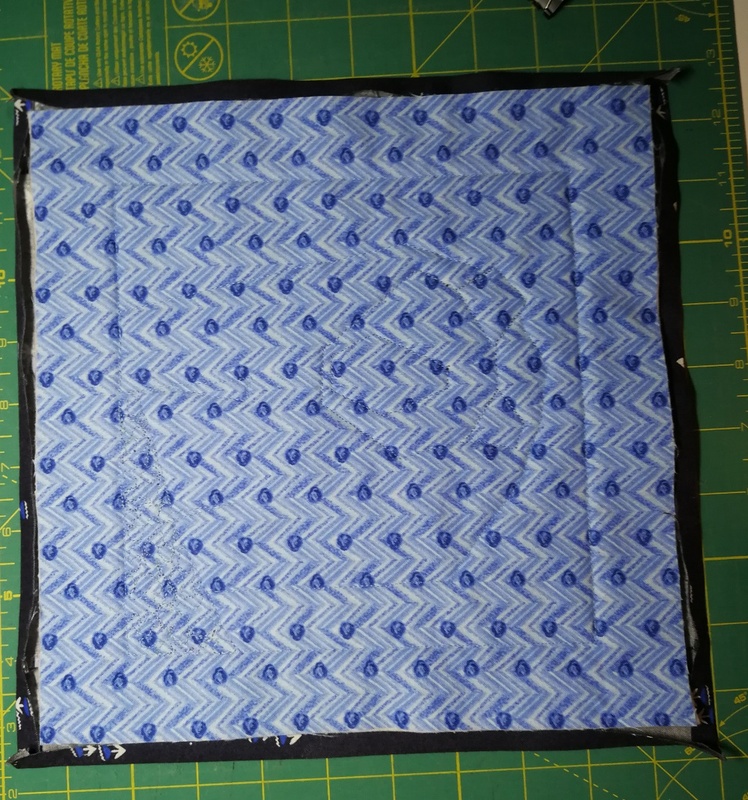 The first one I made has a pretty obvious mistake so I'm keeping it for myself and using it in the binding tutorial below. These minis are perfect for trying out new techniques. 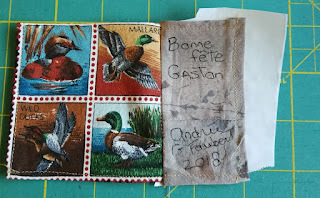 I tried this binding technique on the loon block and then took pictures of the process using the first bear mini for this short tutorial. 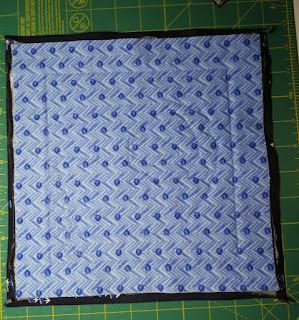 Challenge: I didn't want to add a binding to this block. 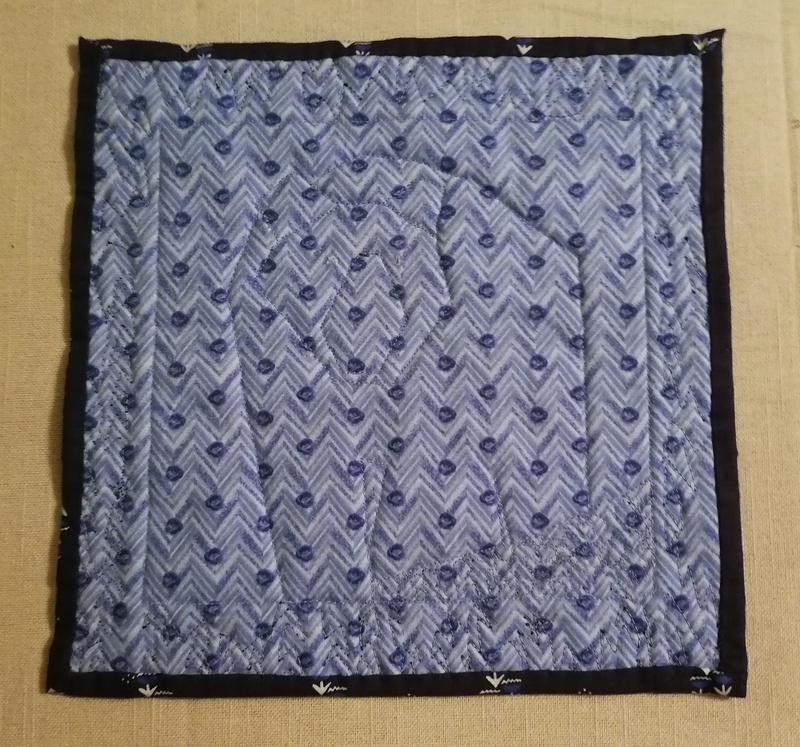 I've tried binding the quilt from the back but didn't really like the results since my corners are not always very good. 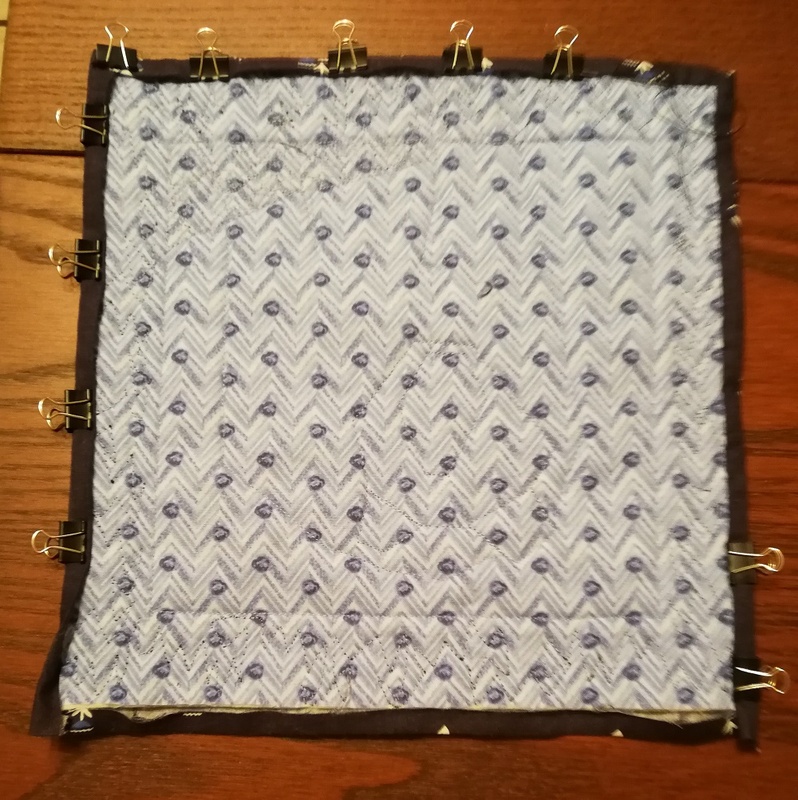 So I essentially made a wider border and used it to bind the quilt. Here is the tutorial. Measurement: Decide how wide you want your border, then add ¼" for your seam allowance and add 1" for the binding. 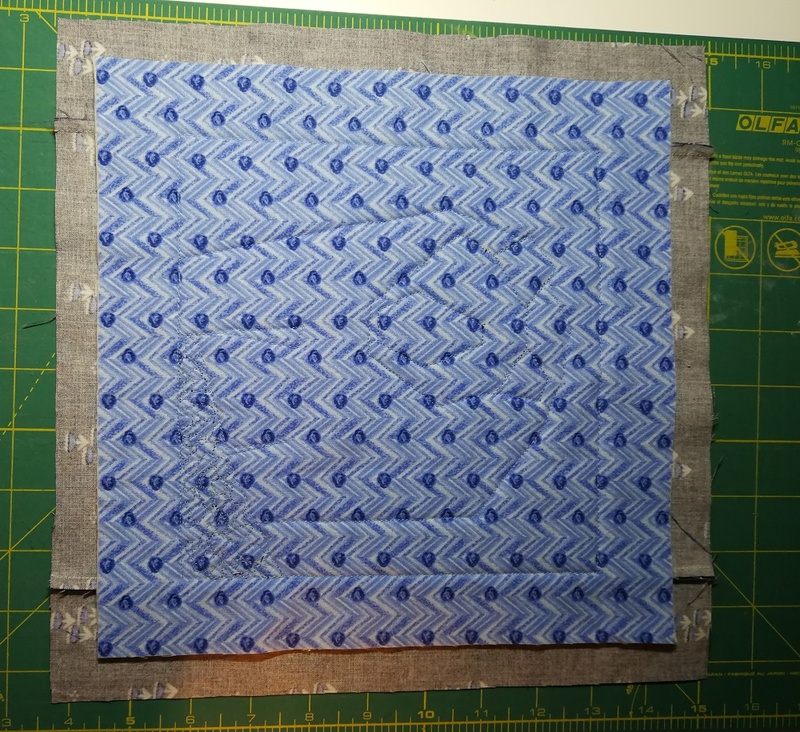 In this case, the border fabric was made from 2¼" strips. (¼" seam allowance + 1" border + 1" binding.) 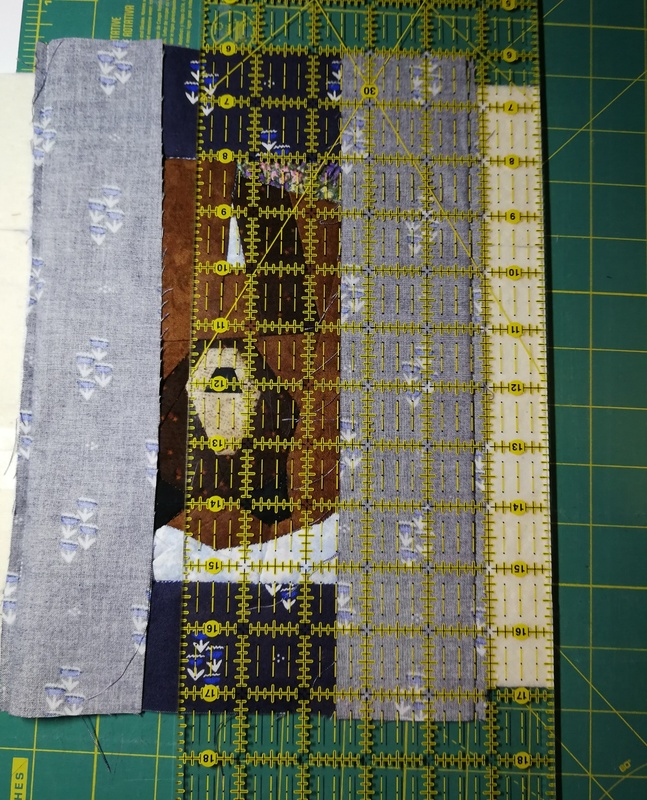 * You can adjust how wide you want your border as well as how much fabric you want to use for your binding. 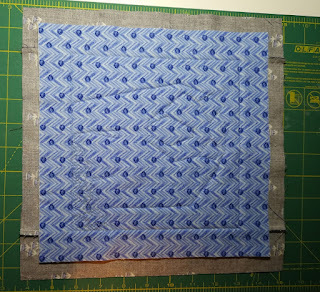 Attach the border fabric to the top and bottom of the block. Attached the side borders to the block. Sandwich the quilt with the batting and backing fabric and quilt the piece except for the border. 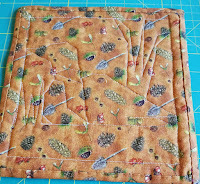 Once the quilting is finished, flip over the border fabric away from the edge. Then, one side at a time, trim the excess batting and backing. The front border extends past the backing once each side has been trimmed. 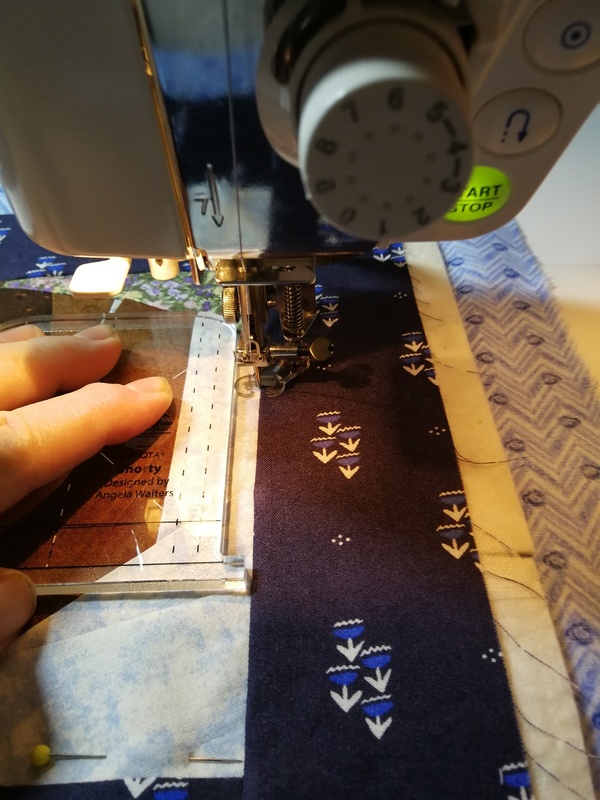 If you want to quilt your border, this is the time to do it! Fold the extended part of the border in half and press. Flip the pressed extended border over the back of the quilt. (I use small metal paper clips to keep my border in place.) Stitch the extended border to the back. This is what the back of the pieces looks like with the border used as the binding. 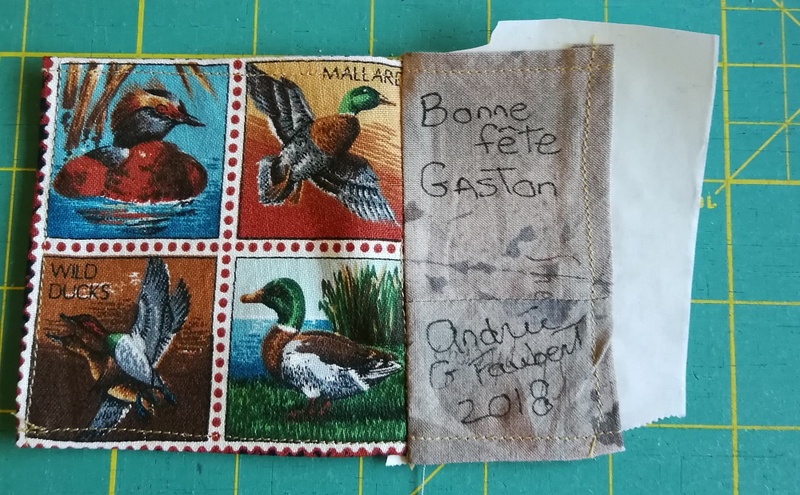 I made a label using some great retro duck fabric and used neutral fabric to write on. As I learned previously, I ironed freezer paper to the back to ensure that the fabric wouldn't shifting around when I wrote on it. Happy Thanksgiving to all those who are celebrating today! Minis are great to try different techniques. 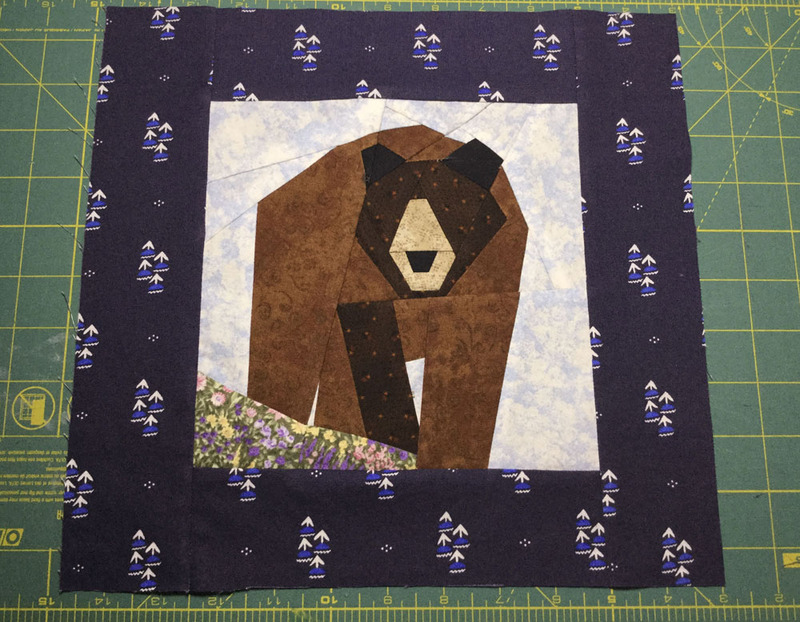 There isn't the investment of time, material and effort that you might have with a larger or more complex quilt. 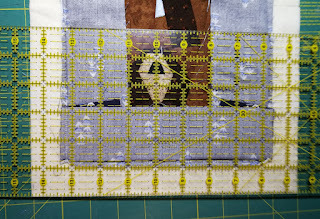 One of the tricky things about foundation paper piecing is that the finished product is the reverse of the pattern. Since I didn't print up the pattern in colour, I mixed up one of the pieces. You can see that the bear block looks like it has a broken leg with a cast instead of the shadow of the leg. 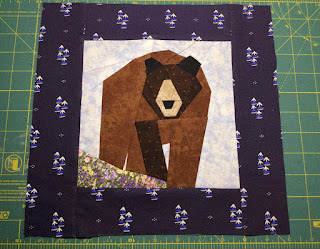 I haven't finished quilting the second bear, but it doesn't have a broken leg! I used Angela Walter's "Shorty" ruler to quilt in-the-ditch. This is the second time I use it and I'm very impressed. 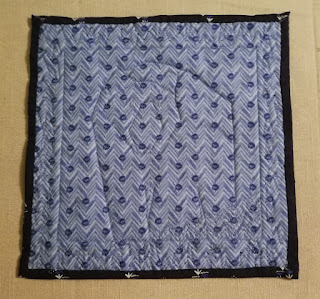 I've never come across this method of binding a quilt, but if it's out there somewhere under another name, please let me know. Hi! This is "Marney" from Made By Marney. Thanks so much for sharing the info about my paper piecing patterns. You are such a sweet heart! Love your post. Thanks Mary, I love your patterns. I'm just sorry that this bear had a cast on its leg :-) The next one will be able to walk well. I can't believe how tiny your loon is! I'm sure you brother loves it. Congratulations on working out your method for binding. Sometimes you just have to do things your own way. Thank you for linking up with Free Motion Mavericks. Your loon is this week's featured project! Lovely blocks! 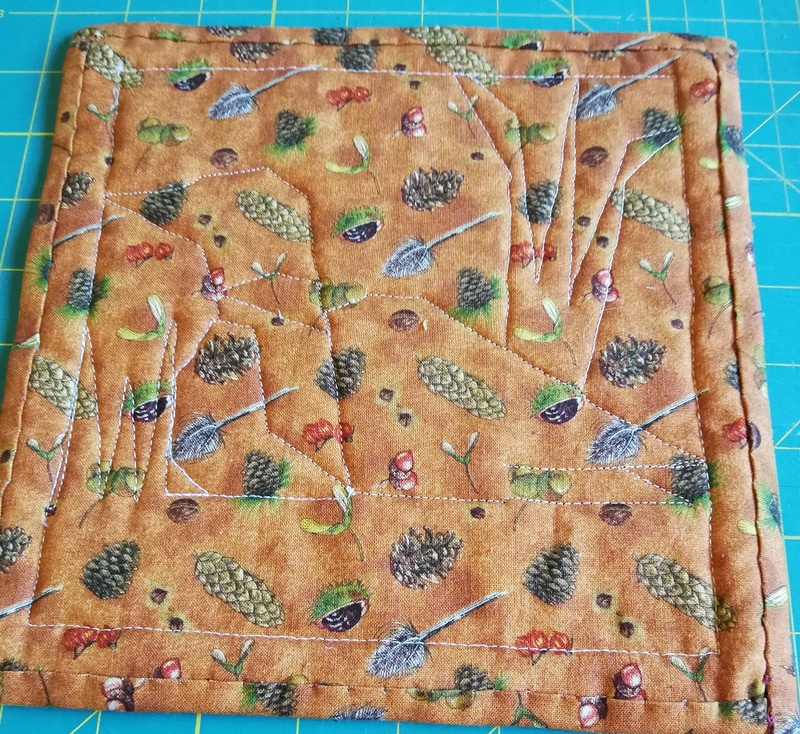 Love the extended border binding technique, very akin to facing, but with borders. Thanks so much for linking up on Wandering Camera! Thanks Soma - yes very much like the facing technique. I'm hoping to try it out on larger pieces to see how well it does. Thanks again for hosting Wandering Camera and have a great holiday. Your loon is lovely. I love the idea of giving a mini as a birthday card. Another something to put on my Something-to-Try list. Thanks Susie. I'm now almost caught up with my mini birthday cards...and replying to the comments! Hope you have a great Christmas! That's a fun binding tutorial. Thanks! Great little method. 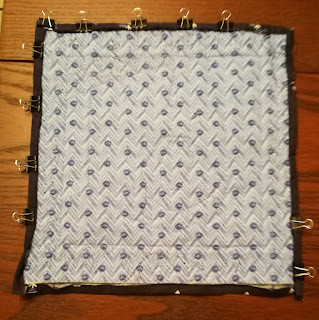 I have a friend who used to "bind" a lot of her kids' utility quilts this way. I don't know that the technique has a name though.